Spending To Fight Wildfires At The Expense Of Preventing Them In Washington state, a community coalition is bringing homeowners, businesses and government together to figure out how best to use what little money there is to protect the land from destruction. Rancher Ross Frank worries that funding to fight fires in Western communities like Chumstick, Wash., has crowded out important land management work. The weed-whacker is a frequent companion to the sounds of chirping birds and rustling pines at Ross Frank's ranch in Chumstick, Wash. With forested land on all sides, he's clearing dense brush beneath a stand of by his house. "So we're turning that around manually and mimicking what fire would have done naturally," he says. "What we have today is largely a big green buffet for insects, diseases and wildfires. Forests are denser; we've got the wrong species in the wrong spot." Eighty percent of the county where Frank's ranch is located is owned by the government. Frank says the government needs to do the same thing he's doing now — clearing out the understory to make future fires less damaging. Most public land near Frank's ranch is National Forest. "At the ground level, they're understaffed, they're underpaid, they're underfunded," he says. Wildfires in the U.S. have gotten bigger, more frequent and more expensive to fight in recent years. But every dollar spent fighting fires means less money for preventing them, or at least making them less destructive. 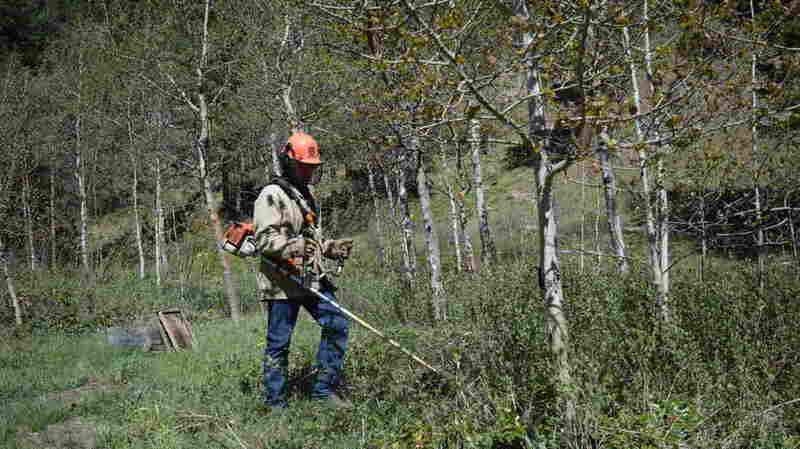 Over time, climate change and the sprawl of new homes and developments throughout the West have pushed the U.S. Forest Service to devote more and more resources to fire suppression. Over the past 20 years, the agency has more than tripled the share of its budget spent fighting fires. "And the problem is that the greater the slice of the pie, budget-wise, that wildfire suppression consumes, the less is left over to take care of the land," says Aaron Everett, Washington's state forester. He says a long history of questionable forestry practices have also made forest management more challenging. "What we have today is largely a big green buffet for insects, diseases and wildfires," he says. "Forests are denser; we've got the wrong species in the wrong spot." By the state's tally, forests with these at-risk conditions cover an area nearly the size of Connecticut within the state of Washington. That's 3 million acres in need of work like thinning, controlled burns, creek restoration or fire breaks. "Our combined budget — U.S. Forest Service, Washington Department of Natural Resources — we don't have enough money to ever even approach that," says Mick Mueller, a local environmental director with the U.S. Forest Service. Compared to the scale of the problem, Mueller says the forest management work feels like one step forward, three steps back. Real change would require action from Congress. But there's been little movement on that front. For residents of Chumstick, meanwhile, another fire season is drawing near. In recent years, large fires have approached Chumstick from all sides. On a drive outside Chumstick, Annie Schmidt motions toward a hillside where wildflowers bloom beneath charred pine trees. "That black just around the bottom part of the trunk. This is, this is good, here," says Schmidt, director of the Chumstick Wildlife Stewardship Coalition. "That home was resilient. They treated [it and] the fire was low-intensity. That's success." She says a recent fire spreading from National Forest land swept through this area once it had been cleared by local homeowners. Funding help for that work came from Washington state. Schmidt says that's how the coalition works: bringing homeowners, businesses and government together to figure out how best to use what little money there is. "It's about treating the right acres, the smart acres," she says. Coordinated planning makes precious land management dollars go a little bit farther. But without more funding, Schmidt says, it won't be far enough.